At Wyoming’s San Juan Diego Academy every morning begins the same for the mostly Latino students. The Catholic school’s Principal Dr. Manuel Brenes gathers the 210 K-8 th grade students in the cafeteria for a happy greeting, a short prayer, and the Pledge of Allegiance to the United States of America. This Guatemalan-born man with a Ph.D from WMU has done this every day since he became the Academy’s principal four years ago. And this daily motivator is clearly working as his first class of eighth-graders just graduated from high school and every one of them is going on to college. This simple, but effective, morning ritual evolved from Brenes’s dissertation study that showed only 45 out of 100 Latino students graduate from high school. That wasn’t good enough for Dr. Brenes so he had to find out why and then do something about it. His vision for San Juan came out of that research. “Number one is motivation,” he says—hence the Si Se Puede. Second is parental involvement; third is a school environment that supports culture and their heritage; and, finally, friends who help support other. Classes are taught in English, but since many are children of Spanish- speaking immigrants, Spanish is taught as an academic subject. Because San Juan Diego is a college-prep school, the students have a rigorous basic-skills curriculum along with art, music, and technology. The private Catholic school opened in 2011 when six priests saw declining enrollments in their parish schools and decided to merge them into one school. Since Principal Brenes took over in 2013, the student numbers have climbed from 135 to 212—a growth he is rightfully proud of. *Pictured above: Bethany Beachum, Fr. 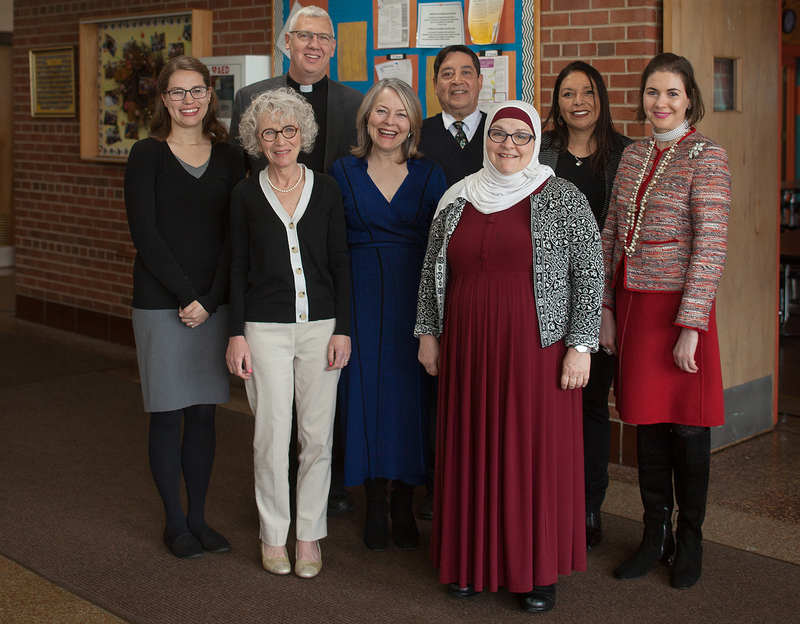 Stephen Dudek, Dr. Manuel Brenes, Emily Aleman-McAlpine, Laura Wege in back; Elizabeth Hetys, Diana Wege and her sister Johanna Osman visiting the K-8th grade Catholic School in Wyoming. Diana and Laura Wege watch Ivan Rubio, 5th grade student, working at his computer. Fr. Stephen Dudek, Cannonical Administrator, Diana and Laura Wege.